Now, this was a pretty woebegone-looking moose. It appeared suddenly out of the thick growth at the edge of the road, where the cowslips are getting ready to burstother people, mostly from away, call them 'marsh marigolds' for reasons I cannot fathomand began trotting along ahead of the truck. "I dunno why people are always going on about moose being so ungainly," I said to Nance. "Look at that action." He had the action of a trotting horse, but moose being moose, not much else. This youngster was skinny, the result of a long winter spent almost constantly on the move, seeking out low-growth hardwood saplings to browse the growing tips off. And his winter coat was falling off in patches, giving him a sort of pinto look. We followed slowly, to give this guy time to find a way out, and he turned onto an old logging road, gracefully jumped a fallen tree, and was gone. "We'll probably see him taking up residence in Beaver Brook, or up in the wallow in the Hollow," I said, and we probably will. This time of year a yearling moose, as my mother would have put it, is Benny in search of Home. 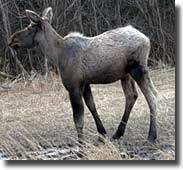 Female moose are getting ready to have their young, often a set of twins. As with many wild species, beaver being the other example that comes to mind, the mothers kick last year's kids out when it's almost time for this year's to come along. 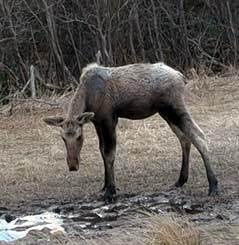 Now, think of these year-old moose as your teenaged kidsmostly gonads, few brains, totally dependent on you for food, shelter and protection, utterly helpless and confused if suddenly deprived of washer, dryer, refrigerator, microwave, shower and TV. Teenagers being teenagers, these moose aren't very good at picking out new digs. They tend to move into places that are definitely marginal moose habitat. Like the mud wallow this side of Stewartstown Hollow, which is basically a glacial basin full of silt. Or Beaver Brook at the foot of our hill, which offers trout fishing for kids, and redwing blackbirds, and singing snipe, and a carpet of burgeoning cowslips, but not much in the way of good moose stuff to eat. Every spring there's a moose there at the foot of the hill, standing there along Route 145 in a place no smart adult would pick to live. 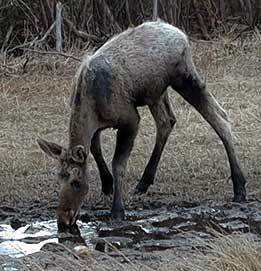 The cowslips are almost ready for their brief burst of golden glory, and the peepers are about to sing, and there's this moose, staring dolefully up from the hock-deep water and mud, chewing on a mouthful of herbage, looking just plain pathetic. I often will pull over and talk to a roadside mooseso OK, commit meand with these guys, just like with kids trying to cross the street, I roll down the window and say "Don't get hit in the road, Bub, I'd like to see you at least make it 'til school's out for the summer." The staff of GoMoose extends many thanks to Mr. Harrigan for gracious permission to reproduce this article.